The EU securities watchdog will be handed the power to force traders to lower holdings of commodity derivatives during periods of market turbulence, according to leaked Mifid proposals. The European Commission’s review of the Mifid directive, a final draft of which has been seen by Global Financial Strategy, will see the EU follow the likely US lead this week in approving curbs on positions. Dubbed Mifid II, it will also introduce restrictions on high frequency algorithmic trading, impose higher standards on firms’ internal risk controls and introduce a tighter third country regime. An accompanying text estimates the “one-off” cost of the industry complying with the new Markets in Financial Instruments Directive regime at anywhere between €512m ($710m) and €732m ($1.0bn), plus “ongoing” costs of €312m ($433m) to €586m ($813m). According to the recast Mifid directive and regulation, scheduled for official publication later this week, national authorities will, where justified, be able to increase basic position limits in their own markets. 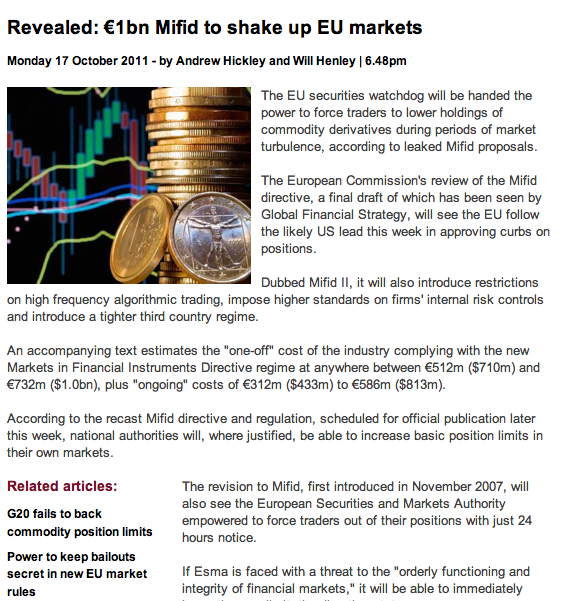 The revision to Mifid, first introduced in November 2007, will also see the European Securities and Markets Authority empowered to force traders out of their positions with just 24 hours notice. If Esma is faced with a threat to the “orderly functioning and integrity of financial markets,” it will be able to immediately issue the new limit, the directive states. The securities authority will however have to consider whether the move would have a detrimental effect on the efficiency of markets, possibly by reducing liquidity or creating uncertainty. It will also have to deliberate whether the move creates a risk of regulatory arbitrage. Any limit enacted by Esma will require a day’s notice before being issued and could be in place for a total of three months. If the authority decides not to extend the limit, it will automatically expire afterwards. The directive says: “The limits or arrangements shall be transparent and non-discriminatory, specifying the persons to whom they apply and any exemptions, and taking account of the nature and composition of market participants and of the use they make of the contracts admitted to trading. Under the revised Mifid proposals, exchanges and trading facilities where the most liquid commodity derivatives are traded will also have to submit a weekly round-up of the aggregate positions of each trader. Member states will be able to request a separate “comprehensive and detailed breakdown” of the positions in place, looking at both the type and identity of the market participant. Other measures in the recast directive include a stricter requirement for foreign supervisors to achieve equivalence with Europe’s regulatory practices in order to allow their firms to operate within the EU. Third country supervisors will have to demonstrate that their firms are subject to authorisation and effective supervision. They also have to ensure their firms are subject to equivalent capital requirements and comparable standards for their shareholders and their management body. Equivalence is also required on a firm’s internal control functions, conflicts of interest, continuity and regularity in the performance of the services provided, outsourcing of operational functions, administrative and accounting procedures, and record-keeping. The review will also see algorithmic traders being required to continue providing liquidity even during times of market disorder. The leaked document says that algorithmic trading strategies will have to be used in continuous operation during the trading hours of the venues that it executes its transactions through. It adds traders will have to ensure their trading strategy sees them post firm quotes at competitive prices “with the result of providing liquidity on a regular and ongoing basis to these trading venues at all times, regardless of prevailing market conditions”. In addition, firms that engage in algorithmic trading will have to have in place risk controls to ensure that their trading systems are “resilient and have sufficient capacity”. The systems should also be able to prevent the sending of erroneous orders, or from functioning in a way that could create or contribute to a disorderly market, the draft says. In addition, firms are urged to have in place effective continuity business arrangements to deal with an unforeseen failing of its trading system. Published amid the furore surrounding the unmasking of a rogue trader at UBS, the document requires firms to have controls ensuring that employees are prevented from exceeding appropriate pre-set trading and credit thresholds. Trading will have to be properly monitored with appropriate risk controls in place to prevent trading that may create risks to the firm itself, or that could create or contribute to a disorderly market, the directive says. Circuit breakers and an EU-wide consolidated tape are among the other measures proposed in the document, which aims to increase a range of transparency requirements. The regulation will also see both pre- and post-trade transparency rules applicable for shares being extended to equity-like instruments including depository receipts, exchange-traded funds, certificates and other similar financial instruments issued by companies.